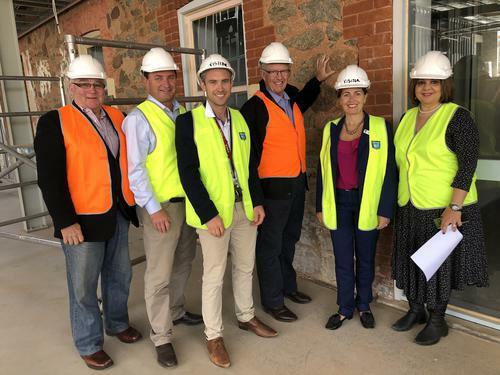 The new $5.4 million YMCA Broken Hill Integrated Wellness Centre is only a matter of weeks from practical completion and today representatives from Australian and State Government, the new YMCA NSW Chief Executive and two Board members inspected the site. The milestone marks five and a half months of construction where 8,636 labour hours have been dedicated to the extensive facelift of the building. Over recent weeks the installation of more than half a million dollars of air conditioning, external cladding, glazing, flooring and services fit out has been completed. YMCA NSW CEO Susannah Le Bron said she was delighted to inspect the site and see the upgrades that have taken place. "This is week five for me at YMCA NSW and I have seen images of the former centre and the transformation is absolutely mind blowing,” Ms Le Bron said. The site is expected to be handed over to YMCA NSW in December with the final fit out, testing and commissioning expected over the Christmas and New Year period. The launch of operations is earmarked for mid-January with transitional arrangements well underway for the local staff team. “The team is working tirelessly behind the scenes to unveil the centre to the community,” said YMCA NSW Area Manager Shane Simmons. YMCA NSW was awarded $3.9 million from the NSW Government under the Restart NSW Resources for Regions program in January last year to redevelop the site into a wellness centre. Hutchinson Builders were appointed to undertake the work in April. Member for Barwon, Kevin Humphries, said, “I know the benefits the YMCA Integrated Wellness Centre will bring to the Broken Hill and Far West Communities and I am so proud the NSW Government has supported this project. The project was also boosted by a $371,000 announcement in July as part of the Australian Government’s Building Better Regions Fund. The funding will see an upgrade to the existing mezzanine level of the centre. Member for the Parkes electorate, Mark Coulton, visited the site in July and said the upgrade to the Integrated Wellness Centre would provide a wealth of physical and mental wellbeing benefits to YMCA members. The new YMCA Integrated Wellness Centre will deliver significant health and wellbeing benefits to the Broken Hill community, with expanded programs and services. Of the newly--created roles, three are for Indigenous people.